VANCOUVER - An alleged victim of human trafficking believed she was coming to Canada for a salon job when she signed her visa applications, not knowing that the paperwork said she was going overseas as a domestic worker, a B.C. Supreme Court judge heard Thursday. The 26-year-old woman from Tanzania testified that in 2008, Mumtaz Ladha, the West Vancouver woman accused of forcing the woman into domestic servitude, asked her to come to Canada for six months. She refused because she didn't want to leave her son, she testified. The woman, who can't be named because of a publication ban, said Ladha then offered her a job in Canada that would pay her $200 a month. "She told me that she's going to open a salon (in Canada), and I'm going to do manicures, pedicures and massages," the woman said through a Swahili interpreter. She said that after discussing the prospect with her sister, who assured her that her young child would not forget her within six months, she accepted the job. "It was not a nice life" living in Africa, she said, and a monthly salary of $200 — more than four times what she once made as a servant — would help support her family. Earlier in the trial, the woman testified that she began working as a housekeeper for Ladha, who splits her time between Tanzania and Canada, when she was a teenager. She said she worked 11-hour days, six days a week, and earned what would now be the equivalent of just over $30 a month. She said she stopped working for a year after she had a baby, but then she got a job as a cleaner at Ladha's beauty salon in Dar es Salaam. She eventually performed manicures, pedicures and massages as well, hoping that one day she would be able to get a higher-paying job providing those services, the court heard. The court heard that after the woman agreed to come to Canada, a passport was obtained for her with the help of someone who worked for Ladha and who pretended to be the young woman's uncle. 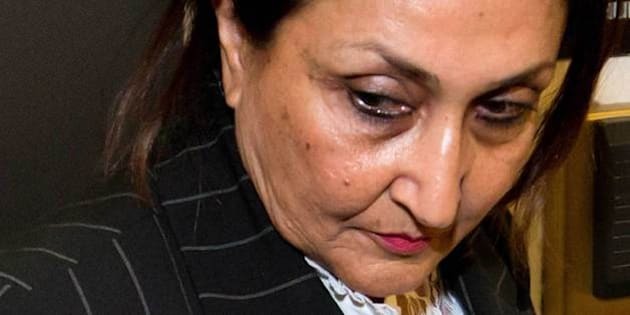 Crown counsel is alleging that the promised salon job never existed, and that upon arrival in Canada, the woman was forced to work around the clock with no pay as a maid in Ladha's lavish West Vancouver home. The woman testified that prior to arriving in Canada, Ladha filled out her visa application, which was written in English. She said she signed all the forms at Ladha's instructions, not knowing what they were saying. According to Crown prosecutor Peter LaPrairie, a visa application that was denied by the Canadian embassy in Dar es Salaam said the woman was a "domestic member of staff," and that she would be going to Canada for two months to help Ladha with a medical condition. "[She] has never visited Canada before, and this will be the ideal opportunity for her to accompany me since I am unwell at the moment," LaPrairie said as he read out Ladha's letter written to the High Commission of Canada in Tanzania. The woman testified that Ladha was not sick at the time of the application. The form also said the woman was a nanny and a housekeeper, which was not true as she was working at Ladha's salon at the time, she said. After the first visa application was denied, a second one was submitted and approved. Ladha and the alleged victim arrived in Vancouver in August 2008. About a year later, the woman fled Ladha's home and arrived at a women's shelter without money, clothes or her passport. The police became involved, and Ladha was charged in May 2011. The 60-year-old has pleaded not guilty to four counts under the Immigration Act: human trafficking; employing a foreign national without authorization; misrepresenting facts to the High Commission of Canada in Tanzania; and misrepresenting facts to Citizenship and Immigration Canada.